SouthworldCulture February 2018Carnival In Mexico. The Great ‘Colourful Fiesta’. Carnival In Mexico. The Great ‘Colourful Fiesta’. Celebrations vary depending on the local indigenous cultures. A journey through the several carnivals of the country. The Veracruz carnival. This festival, which takes place in February, is undoubtedly the most famous carnival in Mexico, as well as one of the most ancient (its celebration dates back to the early eighteenth century) and the one that attracts the greatest number of people, with nearly one million visitors per edition. Carnival traditions in Veracruz date back to 1700 when the inhabitants of the port asked authorities for permission to celebrate the ‘party of masks’. Celebration rituals have not changed much over the centuries, however this festival became important only in the twentieth century, and precisely in 1925, the year that marks the carnival’s first modern edition. The celebrations start with the burning of ‘Bad Mood’, which is the bonfire ritual of setting fire to figures that represent any character, personage or an abstract concept that causes a bad mood: celebrities, politicians, criminals, war, viruses etc. Another highlight of these celebrations is the crowning of the King of Happiness and that of a Carnival Queen. 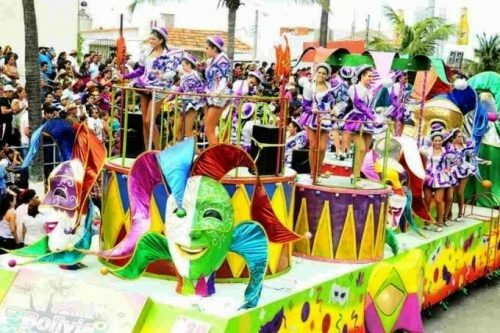 During the week of the festival, the streets of the town hold six masked carnival parades of allegoric floats, while dancers and musicians also from other countries make their contribution to the merry fiesta with their performances. Music plays an essential role in the celebration, so visitors should not miss concerts of classical music, salsa, mariachi, batucada, popular rhythms and the danzón. The Jarocho celebrations culminate with the traditional burial of ‘Juan Carnaval’ and the public reading of his satirical and funny testament. The Carnival of Tlaxcala. This is one of the most colourful celebrations in the country, which is held in the first fortnight of February. 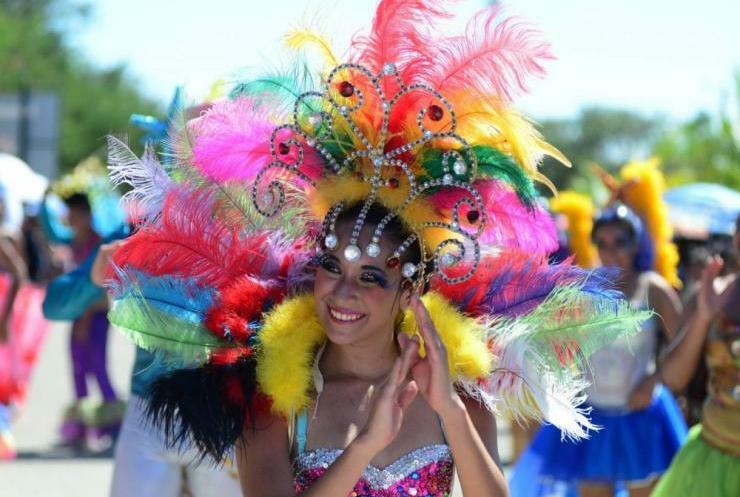 A parade of allegoric floats, dancers and troupes and the election of a Carnival Queen open the festival. 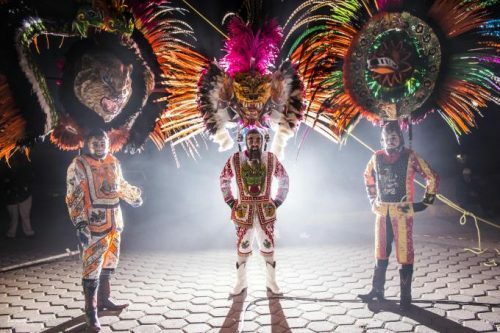 But one of the elements that makes the Tlazcala Carnival unique is the presence of the so-called camadas (gangs in English), groups of dancers whose members are known as huehues (‘elders’ in English), a word that derives from the name of the Nahuatl god of fire, Huehuetéotl. The huehues represent the former landowners, so their customs are very elaborate, showing elegant trousers, waistcoats, shirts, neckties and capes in bright colours, adorned with sequins and glass beads. They wear hats with feathers that simulate indigenous plumes — an element of syncretism — and their faces are covered with masks with Spanish features. Besides the huehues, there are also other groups of dancers called charros (‘cowboys’), paragüeros (‘umbrella carriers’) and catrines (‘dandies’). During the closing ceremony, the leader of each group carries a cross on his shoulders and then places it on the altar of a church. After praying before the cross, the groups dance through the streets until they reach the main square. Mazatlan’s carnival. This carnival dates back to 1823, on the occasion of the arrival of the first ship to the port, an event that marked the beginning of trade between Mexico and Spain. However, there is another version regarding the origins of this festival. 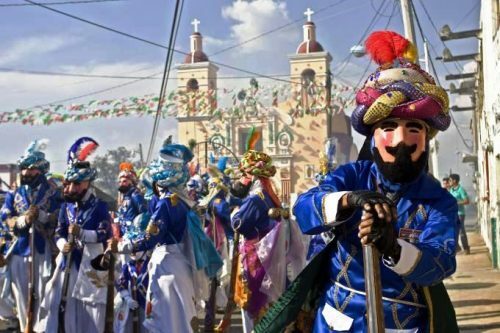 According to ancient chronicles, in fact, on 12 February, 1827 in Mazatlan there was a ‘treat, masquerade and group of people’ in which the soldiers guarding the port participated in the festival that was held. This celebration is the oldest on record and celebrated the ancient roots of the carnival in this port. This event is documented in a report by the Commander of Squadron Mazatlan, Captain Juan Antonio Muñoz. It was, paradoxically, a protest of ‘the troops to demand payment of their salaries’, which degenerated into a rowdy celebration, as described by the commander Muñoz who sent the report of the goings on to the head of the tax office. The first parade of allegorical floats was organized only in 1898. 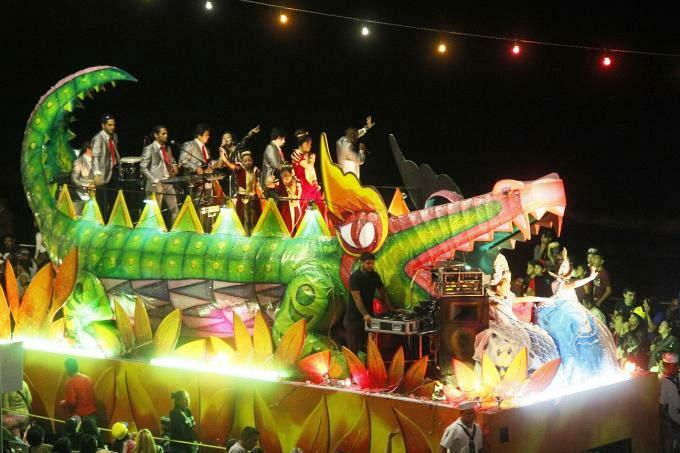 The Mazatlan festival, which is held during the five days before Ash Wednesday, is characterized by the intense rhythm of the bass drum, by band music, by the beautiful beaches where the carnival takes place and, unlike other carnivals, it hosts many cultural events. Each edition is characterized by a different theme. The Carnival of Campeche. According to historical sources, the festival was introduced in 1582. For the ‘Bad Mood burning’, the event that in Campeche also kicks off the carnival celebrations, people use a rag doll dressed as a pirate, since the Campeche port was a target of buccaneers during the colonial period. 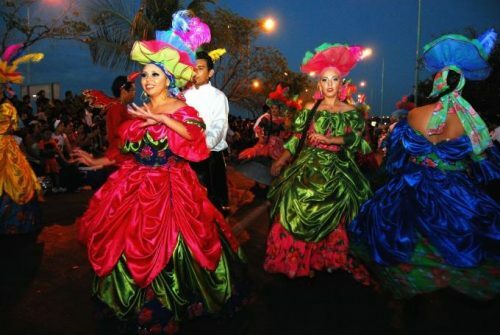 During the festival the Campeche streets hold parades of floats adorned with paper flowers. But the most awaited event by the people of this town is the performance of popular dances that last all day and all night, dances like the ‘Hat’ or ‘Guaranducha’, among others. The most famous of all, however, is the ‘dance of the Pig’s Head’, where women wear outfits called trajes de mestiza and carry trays with a pig’s head decorated with ribbons and dance to a style of music called Jarana. On ‘wet Monday’, prior to Ash Wednesday, the children of Campeche throw balloons filled with water. On ‘painters Tuesday’, neighbors gather to paint each other. The Carnival of Huejotzingo. This carnival shows more traces of syncretism than others. The activities of the carnival focus on a number of re-enactments. This tradition, which dates back to 1893, covers much of the national history because it represents in a theatrical way three episodes that occurred during the pre-Hispanic, the colonial and the independent Mexico times. The stories that are re-enacted are: the traditional indigenous marriage, the kidnapping of the chief magistrate’s daughter, and the Battle of Puebla when Mexican troops overwhelmed the French soldiers, (where a person is disguised as General Ignacio Zaragoza, winner of the Battle of Puebla). Mock battles related to this event are re-enacted. About 12,000 people of the municipality participate in costume and are divided into several battalions: the ‘Zapadores’ represent those of the elite classes in Mexican society, the Apaches, the Zacapoaxtlas, the Indios Serranos, the Zuavos, the ‘Franceses’ (‘French’) that represent a group of elite French troops at the Battle of Puebla) and the Turks. Participants may prepare for up to six months in advance. The richly decorated garments are still locally made, if not by the participants, then by local craftspeople. Masks, hats, tufts, uniforms, tunics, coats of arms and props are part of the costumes. The participants’ parade through the streets carrying hand carved muskets, with which gunpowder is set off making clouds of smoke that fill the air.